When night begins to fall on the sleepy town of Woodinvale, the shadows and fog rolling in bring with them more than just a chill shiver. A living nightmare erupts as the once peaceful community is overrun with the restless dead scratching and clawing their way to the surface with an insatiable hunger for human flesh. Now only a handful of unlikely Heroes are left, banding together to fight for their very lives. On a night that never ends, the only thing worse than death... is becoming infected. Last Night on Earth, The Zombie Game is a fast-paced game of brain-eating Zombies, small town Heroes, and horror movie action. Players take on the role of either the Heroes working together to make it through the night; or the Zombies, unending waves of undead spreading over the town like a plague. Featuring a modular board, eight heroes to choose from, and multiple different scenarios that drastically change the game. 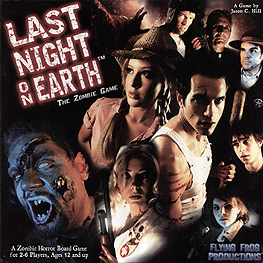 Last Night on Earth is designed to create a cinematic feel as the story and game unfold. So put down that popcorn, grab your shotgun, and hide your brain... The Zombies are coming and this could be your Last Night on Earth! This is the ultimate zombie themed game around, it captures the feeling of traditional B-movie zombie movies perfectly. Usually 1 person plays the zombies and the other player play the heroes trying to achieve some or other objective either before they get killed by the zombies or the sun comes up. Heroes on their turn can either search while in buildings for equipment and weapons, drawing cards from a deck of hero cards, or they can move around the map. If they end their move in the same space as a zombie they have to fight it. In fight zombies and heroes roll dice and if the hero gets a double and at least one die higher than the zombie player they win. Zombies are hard to kill but easyish to fend off. The zombie player can usually move zombies 1 space per turn, while heroes can move 1-6 spaces depending on a roll of the move die. The zombie player draws cards at the start of his turn, then gets to move his zombies and fight the heroes he catches up with. The game works well, there are multiple different missions to try as the heroes such as `Escape in the truck" which is just as it says find fuel, and keys to the truck and escape town or `Burn em out` where the heroes have to destroy zombie spawning pits. The difficulty of the missions varies enormously and game balance is the games biggest problem, bad rolls on either side can result in some very short games. However this is a game to play for the experience, it delivers in terms of atmosphere and is fun to play. The production values are excellent and the miniatures just cry out to be painted. The cards are of good qualiy if a little sticky for some reason. The cardstock for character boards and mission descriptions is really thick, and the presentation oozes quality. If you are looking for entertainment then this is a game you will love, if you are a gamer looking for strongly competitive balanced game you may be disappointed. It seems these days that zombies are really done to undeath; there's even a zombie themed retelling of 'Pride and Prejudice'! the good news is then, that Last Night on Earth really is as the box says "THE Zombie Game". In LNoE up to four human characters, each with unique stats and skills must fight a variety of scenarios (escape in the truck, defend the manor house...) to win out against the ever advancing zombie horde. On their side are weapons and event cards, but against them is an inexhaustible tide of living dead! This game plays well with 2 or 3 players, but 5 is the perfect number; one zombie player and four humans. It's quick and easy to teach, but with satisfying mechanics that suit the theme, which has been treated with a humerous B-movie slant rather than all-out gore. Speaking of the artwork, a cast of actors were assembled for the game and all the art is photographic, adding to the 'movie' feel and giving a real feel for the characters (who all have their own nicely sculpted figure) as they try to survive, there's even a CD soundtrack included. The variety of scenarios and the modular game board keep the game fresh each time and several expansions have been released to keep it interesting, there are even extra tokens and pieces in the box to make up your own scenarios to play. It's not a deep or heavy game, but whenever we have this one on the table, everyone wants a go. It's fun and slightly silly, but there's real danger from the zombies once the board fills up. There are a few zombie-themed games on the market, but this one is the most complete. It's beautifully presented and full of replayability, so if you have any interest in b-movies, horror or co-operative gaming, then give it a go, our favourite moment so far? Father Joseph chainsawing his way through a mass of zombies to light some dynamite. BOOM. P.S. some copies of this game have come with the cards all stuck together. If this is the case, flex the whole deck gently back and forth to separate them (it makes a crackling noise), DO NOT try to peel them all apart individually as this may damage the cards.